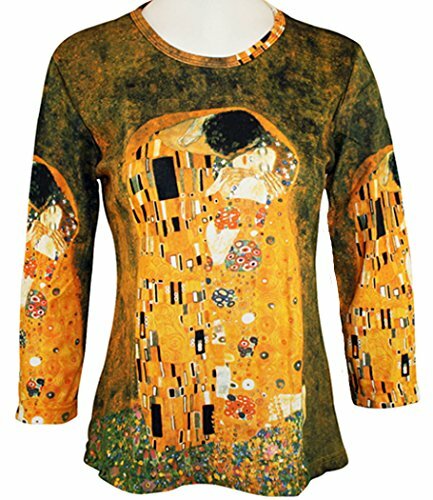 Do you wear your 'art on your sleeve? 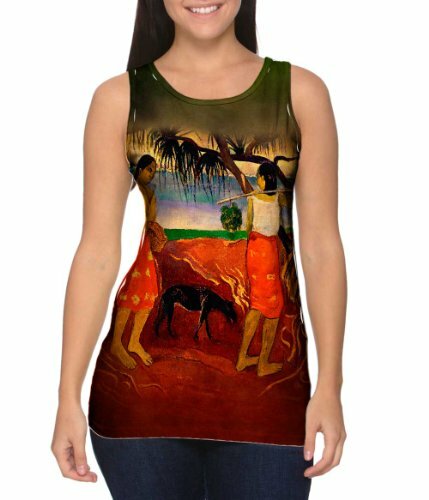 Well, now you can wear it on your chest and back too with these stunning tops and T-shirts. These beautiful T-shirts are bound to start a conversation! Straight away you've made a statement about yourself - you love art and what's more you can't bear to leave it at home on the dining room wall! You want everyone else to enjoy it too! 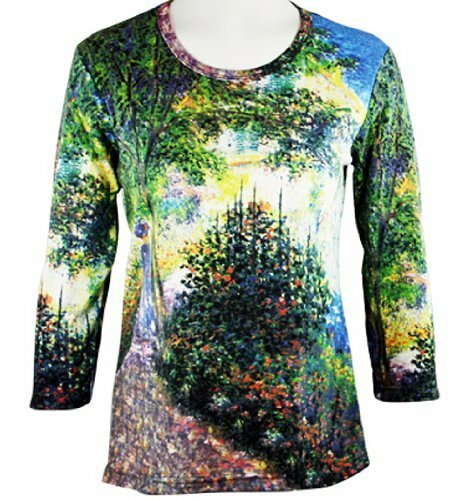 Or perhaps you aren't interested in art at all but just can't wait to wear one of these gorgeous tops or T-shirts just so you can stand out in the crowd. And why not? These days everyone wants to be an original. The T-Shirt - You've come a long way, baby! Get my drift? 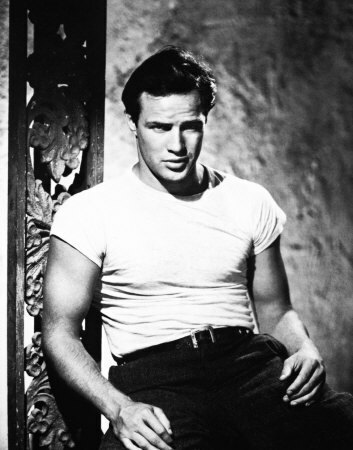 Some things never change of course - and the white T-shirt is still pretty special. Probably more so now that it's quite rare. And if you like art - there's some good prints to choose from! I've never been a fan of those T-shirts which have the image fused onto the front of the T-shirt, usually as a brutal square shape. Do you know what I mean? The image often peels and cracks in the wash and looks stiff and plastic - separate from the material of the T-shirt itself. However, the T-shirts made by a company called 'Yizzam' (also going under the name of 'ArtsyClothingCo') look much more classy, in my opinion. The image covers the whole area of the T-shirt which is much more satisfying to look at. 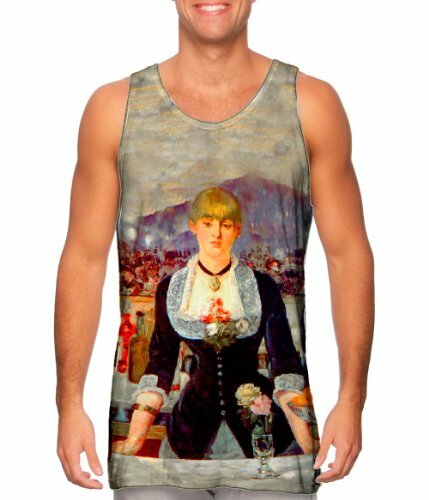 The whole T-shirt or top is a work of art. Yizzam claim that their method of printing will never peel, crack or flake. Their process is a unique, water-based one which ensures that the image becomes 'a permanent part of the garment'. Care of Yizzam T-shirts should include a gentle machine wash in cold water with tumble dry on a low heat. The material used is 95 Percent Microfiber-Poly/5 Percent Spandex. This gives the T-shirts a soft, stretchy feel. Oh, and they also claim that their printing method is environmentally friendly. Any white lines in the crease areas are a natural part of this printing process. The colours on these Breeke T-shirts are very deep and rich. The fabric is a little thicker and the manufacturers suggest that if you want a looser fitting top to order one size larger than normal - this is because the design tapers in the middle. 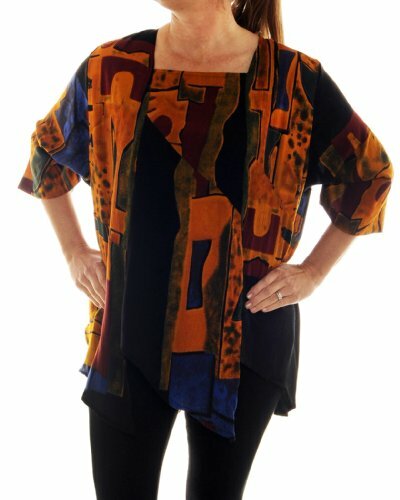 These lovely tops are hand silk-screened meaning that each one is slightly different. Some of the tops will have a limited run, according to Breeke. 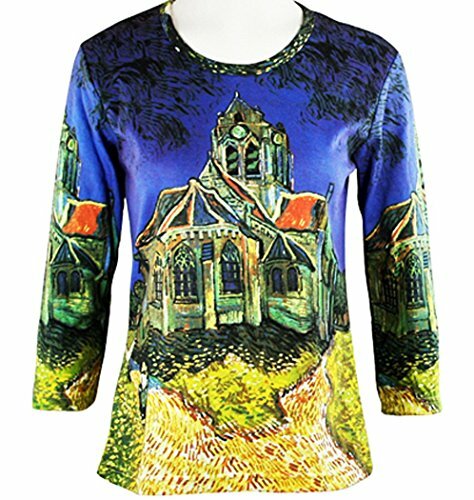 This means that the T-shirts are a bit like the original works of art - unique ! That's a good selling point! Will we see them at Sotheby's one day? Oh, boy! I just love these two gorgeous garments. Made by the firm, WeBeBop, they are arty, bohemian, very Parisian turn-of-the-century, and would look amazing with either formal or casual clothing. I've definitely got my eye on the one on the left - it's got my name on it! These tops are made of rayon. 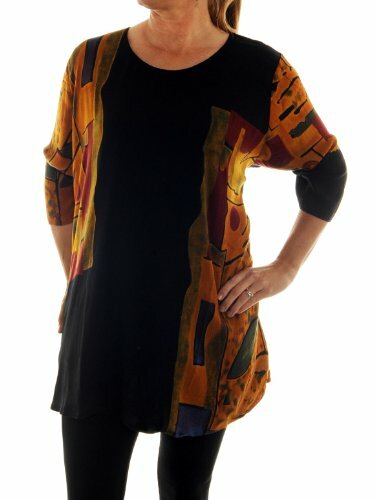 Apparently it is a 'batik' print and each item is unique 'as pattern placement will vary'. 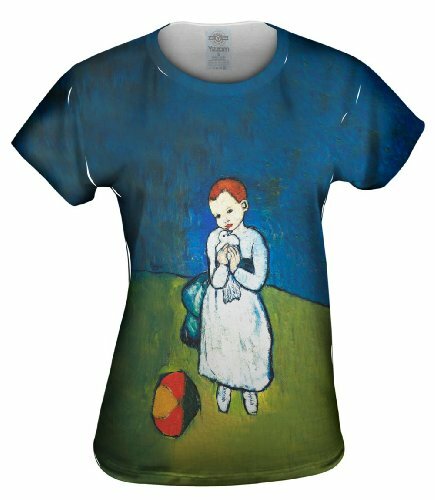 Another piece of unique art based on paintings by Picasso! These are generously cut garments - which I personally love because they are so comfortable to wear, and fall into nice folds and pleats as you move around! 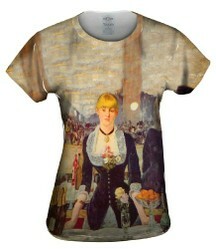 I guess you have to think carefully if you are choosing an arty T-shirt for someone! 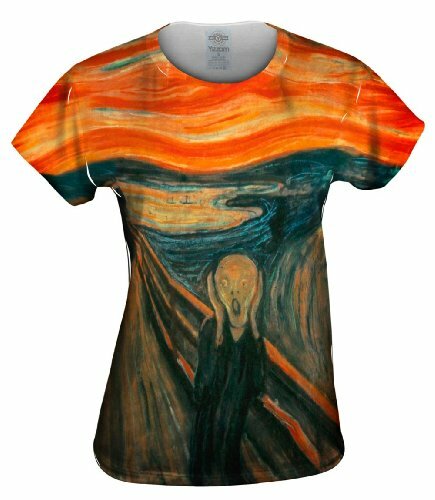 Similarly, a painting like Munch's The Scream is a very popular image - but not for someone who's just suffered a severe trauma. 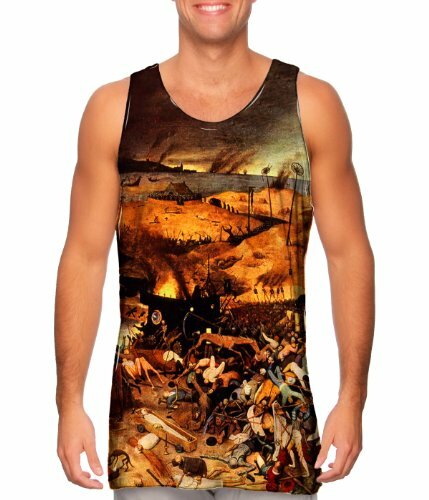 It seems that's how powerful artistic images can be, even on the humble T-shirt - they can offend and upset people as well as delight them. has got a hot date! keep it close to your chest! These Designs Are Just Screaming to be Seen! I think we have to be careful when wearing these T-shirts and tops. 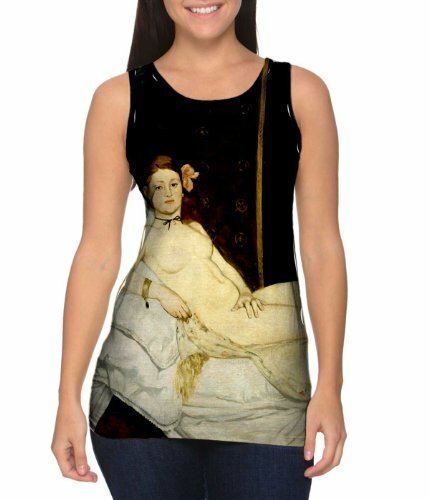 Like all works of art - they want to be seen and admired - so the rest of our clothing should be low-key. Not that I'm a fashion expert - but these T-shirts want to be the noticed and will fight to the death to be the centre of attention! So remember, your body isn't a temple - it's an art gallery and the work must be displayed well. Keep the surroundings low key but well lit! 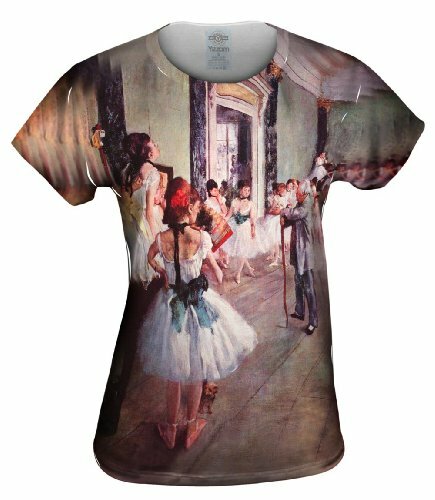 Wear one of these stunning T-shirts and you can't fail to make an 'exhibition' of yourself - in a good way, of course! 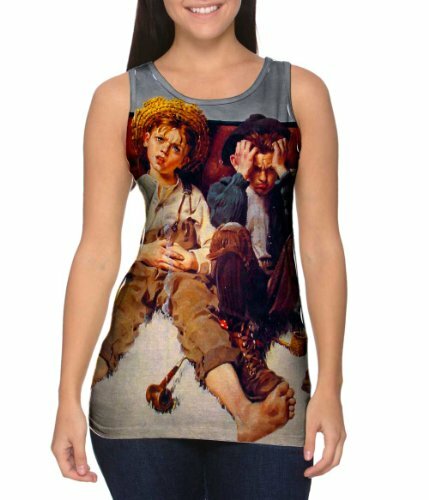 Thanks VioletteRose - yes, it's lovely isn't it - be nice on a child's T-shirt. This is interesting, the Child with Dove looks very cute! Kathleen, Oh my! All of these tops/t-shirts are gorgeous. You've made excellent selections.